Well, this year my kayak fishing has been sporadic, but it is fixing to picking up fast. Last week I was determined to get on the water. Instead of chasing white bass, I met my friend Gary at the river in pursuit of largemouth. I arrived at the launch around 8:15 AM. The air temp was 40 degrees and water temp wasn't much higher. To top it off, the water was 1-2 feet above normal and getting dirtier by the minute. I was sheepishly optimistic, only because I REALLY wanted to catch a few river bass. The trip was also a bit of a landmark for me. It was, essentially, my first river trip since November 2010 where I was not in a Jackson Coosa. Instead, I agreed to test out, give feedback on, and review the Fisher Xtreme kayak by Crescent - a boat Gary is selling. I imagine it was much like being an American driving in England. It is an activity you typically consider a piece of cake, but suddenly a huge wrench is thrown into the works. And although you start out trying to make left turns from the right lane, you quickly realize that it isn't really all that different. So although the Crescent seemed like an uphill battle...I eventually settled in nicely. Next, Gary got in on the action with a solid 2+ lber he caught on a crankbait. Then, he got a bite...a big bite. The fish went airborne multiple times and pulled some drag as it thrashed. The beast just would not stop fighting. Finally, it came to the side of the boat and Gary reached to grab her. As he did, she gave one last jump, threw the hook, and was gone. The fish was in the 5.5-6 lb class by our estimation - an impressive fish for such cold water. Then it was my turn again as I picked up another chunky largemouth on a Spro Little John crankbait. I would pick up two more fish on the bait, both in the 2-3 lb range, before the day was done. Gary also stayed hot with his crankbait as he landed 3 or 4 more bass of about the same size. By 11 AM the wind was pushing us all over the place and we leisurely made our way back the launch with only a couple more short strikes. We were both quite happy with our morning on the water and glad we were able to get out. Over the past few months, I have been taking a long look at the kayak market. It seems like every year, companies are breaking out new, innovative boats and accessories. There are so many great yaks out there, it is hard to choose just one. I have been evaluating boats for my needs, which break down something like 75%-80% of trips in flowing water and 20%-25% in lakes. I need a boat that excels on the river, but also allows me to paddle easily across long stretches of open water. I also want something super stable and comfortable. I came up with a small list of boats that fit my criteria and finally came to a decision (coming next blog). During this whole process, I found out that Gary Ribet was becoming a dealer for Crescent Kayaks and both he and owner James Derbecker reached out to me to test out the boats and give my input. After spending some time with both the 10 footer and 12 footer, I came away with the following thoughts and opinions. First, the 10-footer. This boat perplexed me a little. The dimensions were odd, the scuppers were in bizarre locations, it didn't have side handles, and the deck wasn't as wide as it could have been. However, I still managed to come away fairly impressed. Gary has them pre-rigged with 4 rod holders, a sea light, ergonomic seat, and even a Bending Branches paddle...all nice touches. The boat was very stable at 32" wide. In fact, I am sure I could have stood in the boat had it not been late winter. The rear deck storage area can hold a lot of gear and a lot of weight - evident by hauling my huge tacklebag for the day. And overall it was well made. The boat tracked well and got me where I wanted to go at a reasonably average speed. It is also very light and easy to carry and load solo. 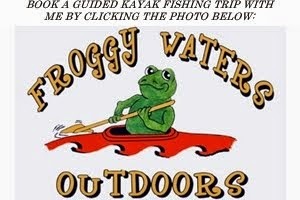 If I were looking for a beginning fishing kayak, it would be on the list - especially because it is very well priced. However, the details that I crave as an experienced yak fishermen need some upgrades. The 12-footer is a tandem boat and I actually had no intention of liking it. But, when I finally got to take it for a spin my gears started turning. At this point, it is a little rough around the edges, but it has some flexibility because it can be paddled solo as well. The depth of the hull is very appealing and at 33" wide, standing is a breeze. The front hatch and rear deck storage area are more than adequate. And the boat moves suprisingly well in the water, although it is a tad slow and is prone to catching some wind at times. It is also a beast of a boat to get on an SUV. In fact, I highly recommend not doing it solo for fear of hernia. However, I believe the boat has a ton of potential. A few tweaks to the seating, balance, and weighting and you have an awesome solo, 12 foot, fishing yak on your hands. As is, it is a nice tandem boat that would suite a lot of people quite well. If you are interested in taking one of the Fisher Xtremes for a spin or even purchasing one, give Gary a shout (garyribet@froggywaters.com). As mentioned above, I have been looking at new yaks for a while. Over the past couple of weeks my stars somehow aligned and now I have a really great opportunity in front of me - including a couple new yaks. Hopefully, I can give you the full run down soon....until then, tight lines! Very true. The Crescent is actually a wide boat (32"), but the actual deck space is only about 20"-22". It just seems like a giant waste of space. I either want a nice wide, full deck or a narrow, faster, ergonomic boat. It is definitely warming fast - 80's in March?! Your post really helped me to understand this. It has great details and yet it is easy to understand..